I have finished the entire background of the sweet bag, despite attending Great Southern Gathering in Radelaide for a long weekend, a 4 day weekend of being quite sick, and a week of intense house hunting. The project is at an estimated 100 hours of solid embroidery. Keep in mind that the embroidered area is only approximately 9.4cm by 18.8cm in total. This bag is in the smaller tail of extant bag sizes (see the first update for the graph and references). The amount of effort that would be required to embroider even larger bags (e.g. a total area of 14cm by 28cm for the largest extant bag I’ve observed) astounds me. It is no wonder that such heavily embroidered and ornate bags were given en masse to Queen Elizabeth I by the Lords and nobles of her time (as recorded in various New Years inventories). As a bit of fun, if you take the above information and divide the total embroidered area by the time taken to embroider it, you can apply that rate of embroidery to the larger bag (14cm x 28cm) to estimate 221.8 hours to completely cover the surface in a similar ratio of stitches to my bag. Woah! There will be stitches added to bottom of the bag (i.e. the centre line of the picture below) and side seams. They’ll likely be another kind of braided stitch rather than Elizabethan plaited braid (because, you know, learn all of the new stitches!). The base of the sweet bag is now complete. It is approximately 100 hours in the making. The next step is to create the tassels. All but one of the 32 extant bags I’ve observed include tassels. There is a wide variety – some are fluffy, some consist of knots and some include embroidered beads. 75% of the extant bags had tassels along the bottom of the bag, and hanging from the drawstrings. 22 of the 32 bags (i.e. 68.8%) consisted of three tassels along the bottom of the bag with two tassels hanging from the drawstrings (one on each string). For symmetry (i.e. personal aesthetic reasons) and consistency with period practise, I decided to use this tassel format for my sweet bag. For my tassels, I’ve been inspired by a sweet bag that has needlelace tassels made to look like grape leaves (Accession Number LEEAG.2008-8-3, published by Carey, 2009). 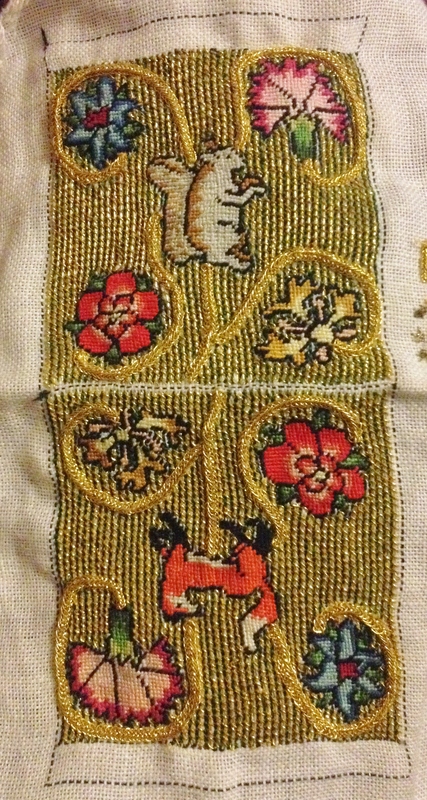 As my bag depicts a squirrel, I have chosen to make oak leaf needlelace tassels. As three appears to be a consistently favoured number for sweet bags (both in number of tassels along the bottom, and number of elements within an individual tassel), I’ve decided to do groups of three oak leaves for each tassel. According to Carey (2009), the grape leaf needlelace tassels were made by using metallic thread as a scaffold for using buttonhole stitch in silk. The method was worked in the hand and did not require any base to work from (i.e. the outline didn’t need to be anchored by fabric or parchment). I attempted to use this method, following the instructions in Carey’s book. The middle of the leaf is rather easy to construct. The lobes of the oak leaves, however, become very fiddley and a little difficult to construct in any consistent manner. 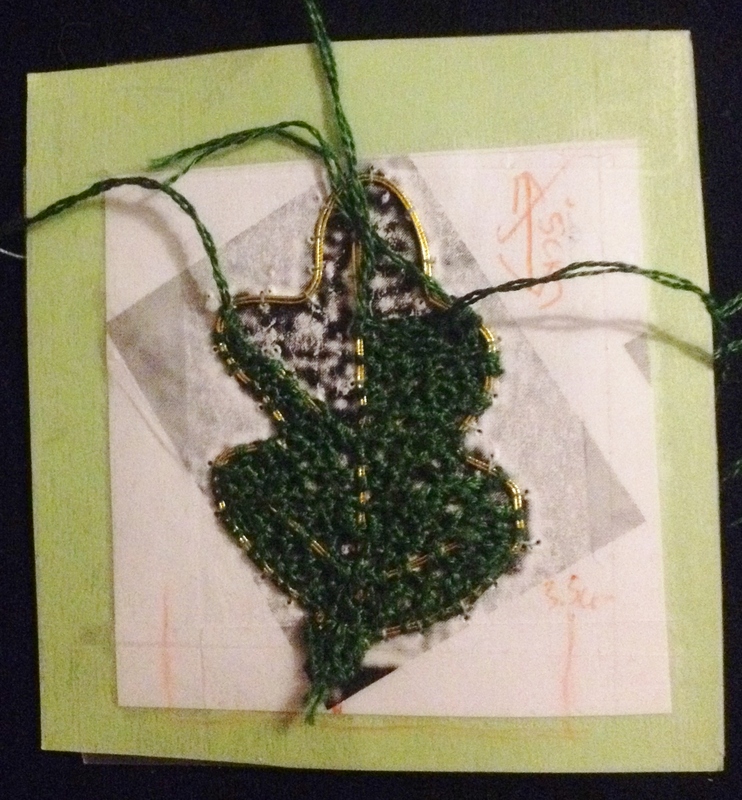 It’s also a time consuming method, though, my experience is that most needlelace is time consuming in nature. Attempt 1 at the oak leaf tassels. Gold thread scaffolding, embroidered with silk buttonhole stitch. Attempt 1 at the oak leaf tassels with the beginning of two lobes of the leaf. 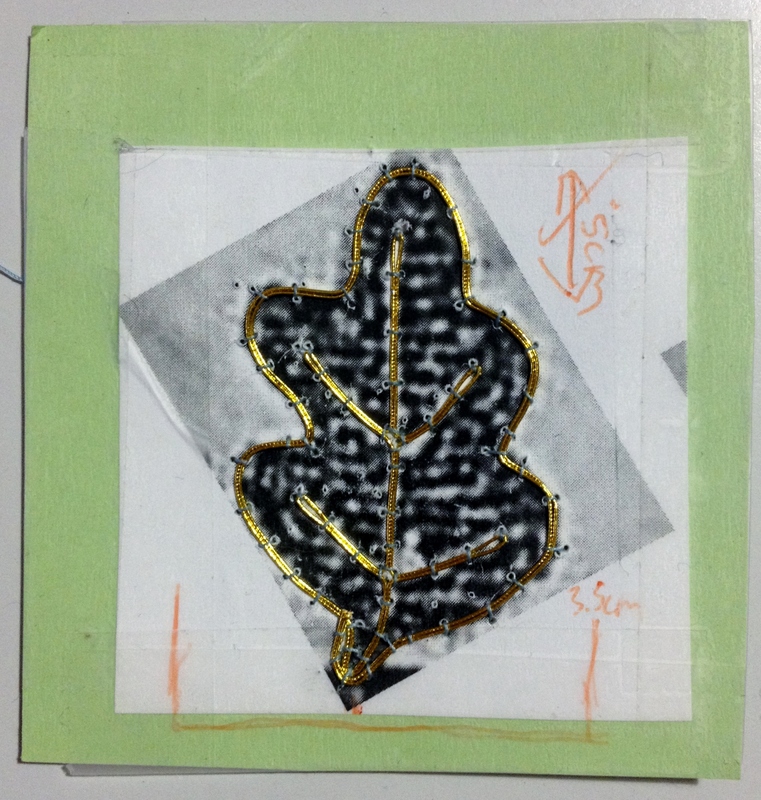 This method appears to be difficult for achieving consistently shaped oak leaves. As such, I’m currently attempting to make the tassels out of another period method; where detached needlelace was created by couching a scaffolding thread to parchment that included the pattern. These scaffolding threads were then in filled with stitches, predominantly detached buttonhole stitch (Mallett, accessed 2013; The Lace Guild, 1997-2013). This second attempt at an oak leaf tassel (of which I will need 15 in total) has been completed with a gold thread scaffold with green silk infill in double Brussels (the instructions for this pattern of buttonhole stitch can be at Halley, 2010). I’ve embroidered using double Brussels once before when I completed a small needlelace sampler (see https://cearashionnach.wordpress.com/gallery-of-random/laces-and-cutwork/ for pictures). 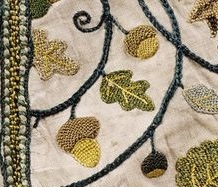 The leaf shape is copied from an Elizabethan jacket of a similar style of embroidery as to sweet bags (see picture below, which is sourced from the Victoria and Albert Museum). Oak leaf used as the pattern for my oak leaf tassels. It’s from an Elizabethan Jacket, 1590-1630, made in Britain/United Kingdom. Victoria and Albert Museum, Museum Number 919-1873. Tassel attempt 2: Green cardboard with paper pattern sticky taped on top. The gold thread was couched down to the cardboard, following the outline and veins of the oak leaf. 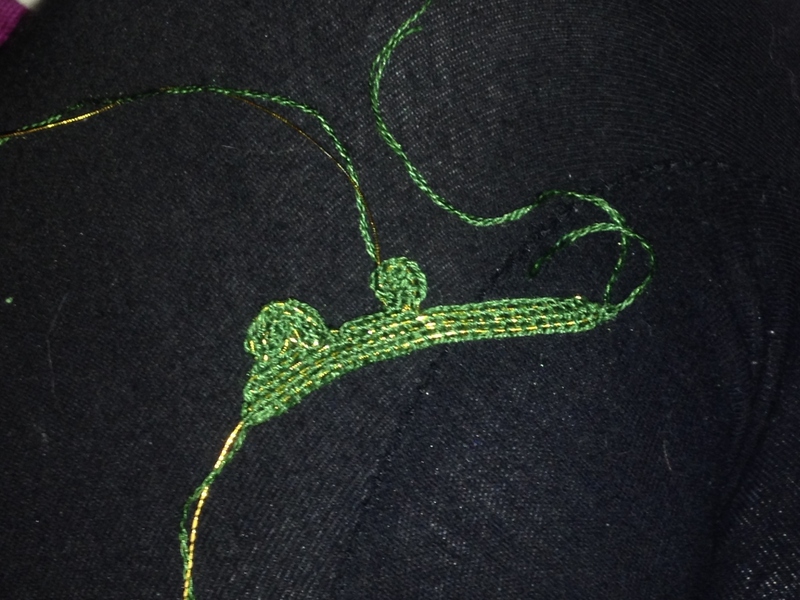 Tassel attempt 2: the leaf shape is filled in with detached buttonhole stitch in green silk. I’m aiming to have, at least, the majority of tassels completed by the next reporting date (in three weeks). However, these tassels will be individually time consuming. I’ll also post an approximation for how long a tassel takes to complete in the next post. Carey, J. (2009). Sweet Bags: An Investigation into 16th and 17th Century Needlework. Published by Carey Company. ISBN 0 9523225 7 9. Halley, L. (2010, accessed October, 2013). 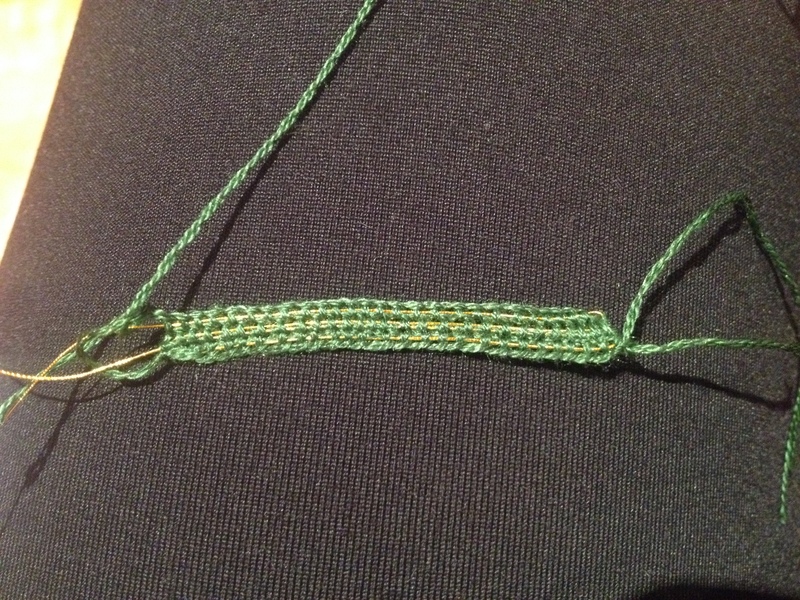 Stitches for Needle Lace. The Lace Guild, 1997-2013 (accessed September, 2013). The Origins of Lace. Mallett, Marla (accessed 29 August, 2013). Antique Needlepoint Lace. Victoria and Albert Museum, accessed October 2013. Jacket, 1590-1630, made in Britain/United Kingdom. Museum Number 919-1873.